Peeking beyond the driveway gate of Craig and Judy Stark’s 52-acre Warren County property creates a feeling of anticipation for the garden that lies ahead. Thousands of gemstone-colored daylily and spiderwort plants provide a grand and welcoming entrance. Indeed, the Starks’ hospitality and love for the land are immediately evident by their home’s dining terraces and their multi-acre garden spaces amid mature trees, reclaimed prairie, an orchard and two ponds. 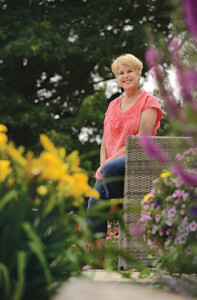 Growing up in Michigan, Craig, a Des Moines physician, fell in love with the 100 acres of botanical beauty at the Dow Gardens, established by the founder of Dow Chemical Corp. Those boyhood memories influenced his vision for the couple’s Iowa property. With that vision in mind, the Starks worked side by side every weekend for four years to clean and reclaim the land. They started by burning off acres of the unwanted bromegrass and then drilling holes into the ground to plant the prairie flower seeds. “We don’t golf; we don’t really have any hobbies,” says Judy, a Des Moines health care executive. “Loving the property became our hobby. We have such a good time working together. After four years of intense labor to reshape the property into prairie and orchards, the Starks spent another two years working with their contractor to build their stone home. With all of that work behind them, in 2009 they turned their attention to designing and creating the garden spaces surrounding the home. Built into the hill on the north side of the home, the large gardens beckon friends and family with beautiful sights and sounds. The multi-tiered waterfall and stream create a soothing percussion of rushing water, complemented by singing birds in the mature trees. As in an ancient tapestry, the plants Judy has selected for the garden beds surrounding the waterfall are planted in massive drifts; their rich jewel tones can be seen from across the property. One of Judy’s favorite areas, which can be enjoyed from the dining terrace overlooking the waterfall, is the shade garden, home to hundreds of large hostas. Judy especially loves the chartreuse-hued variety known as Guacamole. Daylilies, one of Judy Stark’s favorite perennials, line the long and winding driveway, mimicking the plant-adorned entrance of the Dow Gardens in Michigan. To reclaim the prairie, the Starks first burned off the overgrown vegetation. They then drilled holes into the ground at calculated intervals and planted native prairie flower and grass seeds in each hole. Keeping true to reclaiming the native spirit of the property, the Starks chose Iowa Buff pavers as stepping stones to lead visitors from the top dining terrace to their newly expanded shade garden. 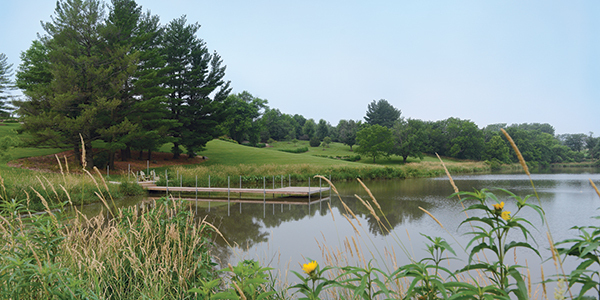 The top dining terrace offers an expansive view of the property, including two peaceful ponds. The shade garden features vibrant astilbe, large hostas, old-fashioned bleeding hearts and ferns. A combination of both sun- and shade-loving native plants surround the cascading waterfall and stream, located in the north garden and designed by Ted Lare Design Build. This fall, the Starks’ niece will be married on one of several dining terraces nestled next to the stream.